The client and I began an email exchange followed up by a phone call, and I learned that this little girl is so fortunate as to have a New York fashion executive for her momma! Ah, the pieces fell into place. I soon received the client’s box. This is corny, but I felt like a youngster on Christmas morning as I opened it. I had never seen so many beautiful sweaters all in one place. Since I had several custom orders already lined up, I had to put this project on hold for a bit. But my mind was already at work on the puzzle before me: What to do with an entire rainbow of colors? I’m accustomed to working with 1 or 2 centerpiece sweaters provided by a client, but this was completely new territory. One afternoon as I once again pulled the sweaters from their box and considered how to incorporate as many as possible, I realized that their colors reminded me of the illustrations in a book of poems I read to my daughters when they were little. I got out the book. I got out a couple other children’s books as well for inspiration. 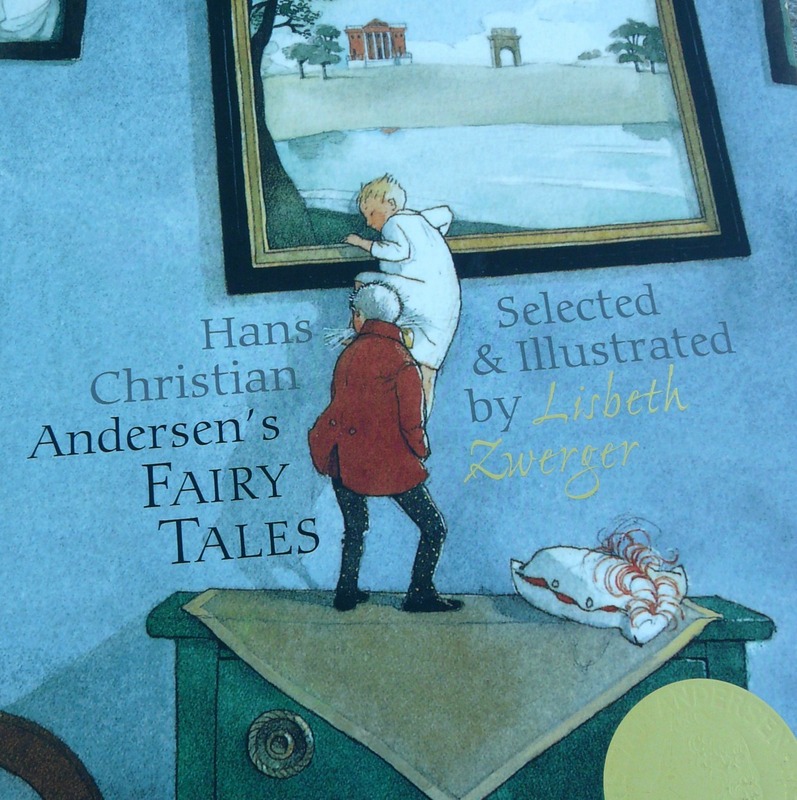 And when I got to this book of Hans Christian Andersen’s Fairy Tales, illustrated by the wonderfully talented Lisbeth Zwerger, the ideas started triggering like explosions in a high-scoring game of Bejeweled. Especially when I saw the page below. For I recalled that Calliope, the young owner of the sweaters, enjoys making things by hand (a girl after my occupational-therapist heart!). And one of those things is CASTLES. Yes! A fruitful idea! I don’t know if Calliope’s parents chose her name for the Greek muse, but I did feel grateful that some muse had finally tapped me on the shoulder :). As I worked on the blanket, I frequently recalled my own daughters’ imaginary worlds when they were young — “I wish I could live in the Berenstain Bears’ treehouse!” “Mom, will you build blocks with me? Let’s make a house with a zoo next door.” “I want to live in England someday!” Oh, wait. That’s what Daughter #2 says now. Guided by a clear idea, I plowed ahead, working out what I saw in my head. It meant I had to devise some new ways of putting the wool pieces together to create the hills and the clouds. Thankfully, I hadn’t promised the completion of the blanket until fall. I did make the deadline, although admitting to that suggests a certain amount of lameness, doesn’t it, since I didn’t post it until now. Ah, well. 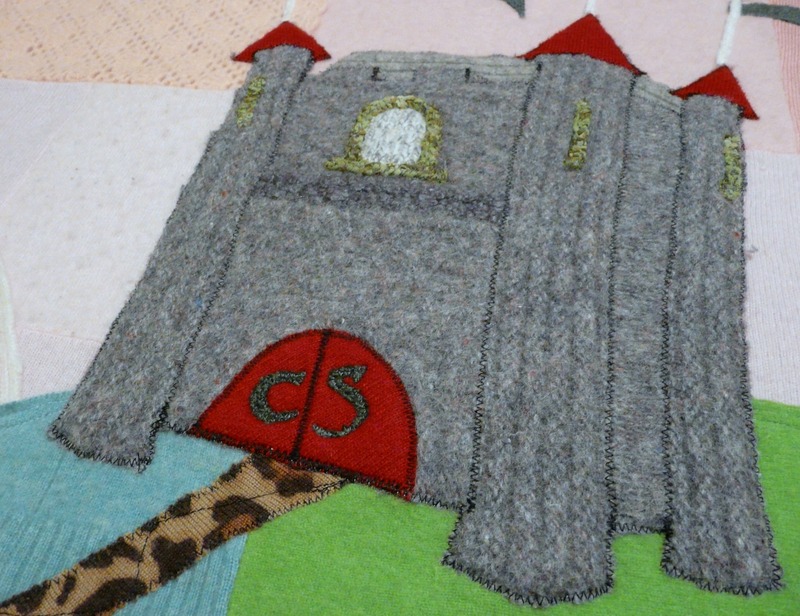 I added Calliope’s initials to the castle doors just before sending the blanket to its new home. For the font, I adapted PR Celtic Narrow by Peter Rempel — appropriate for a castle, I think! Calliope, I hope you continue to use your imagination for years and years, all through your life. It’s a precious gift we humans have, one we should never outgrow! Thank you, Sandi, and welcome to the blog! Incredible! I absolutely love this! I amazed how the colors gradually flow like a rainbow! Oh Joan! I’ve made a few felted baby blankets last year, but this one of your’s is really in a class by itself. It truly is exceptional. My admiration for your talent with this art work continues to grow exponentially, especially because I also make felted quilts. Thanks so much for sharing your art. Donna! I’m glad you’re continuing with the felting and sewing! I would love to see your quilts. Email me photos, please?? Thank you, everyone. I wish there were some way I could show you this one in person. A photo never can do justice to the lovely quality of the wool itself. It amazes me every time. Joanie, what a lucky little girl to receive a beautiful blanket you designed,absolutely gorgeous . 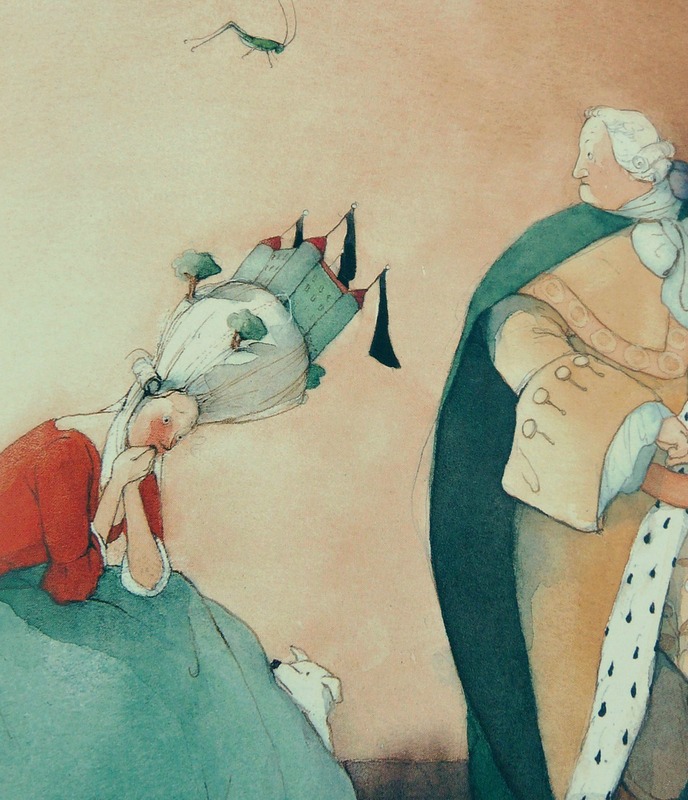 Lisbeth Zwerger! Castles! Initials on the doors! So adorable and magical. Beautiful! 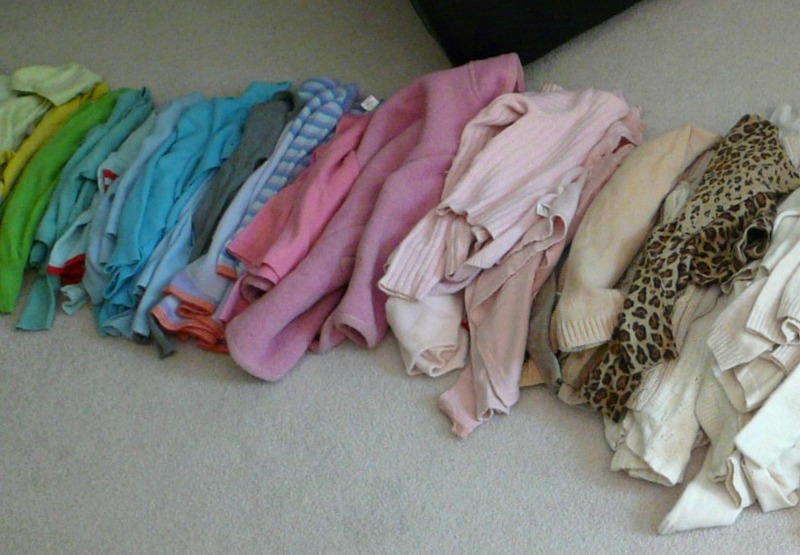 I have some of my boys clothing that I would love to have someone make into a blanket or quilt. Is any of it wool?? 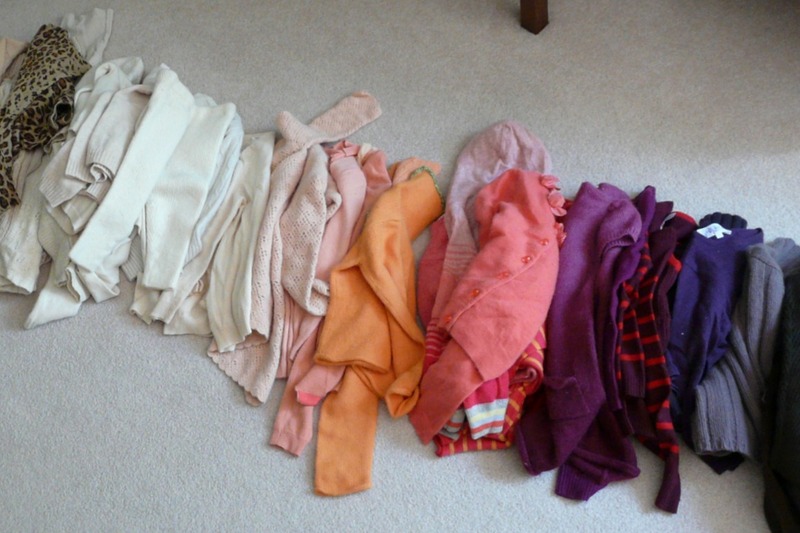 Wool sweaters make incredible blankets! Dear Joanie, This is just lovely what a treasure for a little girl to dream under. I love the way you used the pinks in the sky, like the colors sometimes at sunset.